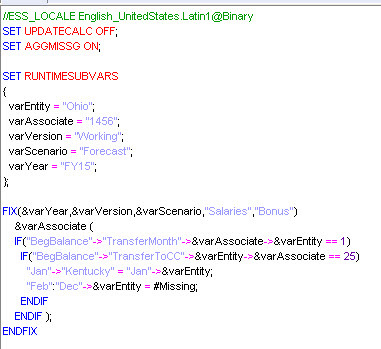 Okay, what I’m really talking about is Runtime SubVars in Essbase. I use these for testing, but very heavily for recreating variables I have in Planning. Instead of hardcoding the varaible values, I create runtime subvars to do my dirty work. If you have variables that you use in a Workforce planning application like varEntity, varAssociate, varVersion, varScenario and varYear, it can be a pain to test out in the Essbase calc script editor (which is MUCH better than the BR script editor). Voila! You have (kind of) replicated Business Rules variables in Essbase. This method is also great for testing variables without searching and replacing the entire script for a single value.